While I love to cook, I do not love to bake. For the most part I loathe the exact amounts and extended list of instructions. Including that some things need to just hang out for a day or two. That is annoying. And my other, possibly bigger problem, is that I cannot resist anything made from flour and baked in an oven. Be it bread or cookies or cake, that batch will be taken down in a day. Not kidding. But, given the amount of times we order pizza and how much I love a good thin crust fresh from the oven (I miss you Piece), I thought pizza dough is really something I want to master. And while the jury is still out, I think I have found the perfect recipe for the absolute novice baker/cook. Seriously people, there are minimal steps and it is fool proof. This coming from someone that always forgets an ingredient and has zero patience for things not coming out right. The best part about this recipe is that you can make the day ahead, the morning of, or a few hours before. It can work into your schedule, not the other way around. In a very large bowl, mix all ingredients with a spoon. The dough will be craggy and rough; this is fine (see above left picture), but if it feels excessively so, add another spoonful or even two of water. (See Note up top about altered water level/flour heaviness.) Cover bowl with plastic and keep at room temperature for approximately 22 (for Overnight schedule), 12 (for All-Day schedule) or 6 (for Part-Day schedule) hours, or until the dough has more than doubled(see above right picture). This takes longer in a chilly room and less in a very warm one, but don’t fret too much over this, as the dough is generally forgiving of a loosened schedule. Spray an old baking sheet very lightly with a nonstick cooking spray before sprinkling it with cornmeal (if you do not have cornmeal, just spray heavier. Heat oven to its highest temperature, usually between 500 and 550 degrees F.
Flour your counter very well. Scrape dough out of bowl onto floured counter; in the time it has risen it should change from that craggy rough ball to something very loose, soft, sticky and stretchy. Flour the top of the dough, and divide dough in half (or more pieces, if you’re making smaller pizzas. see bottom left picture). Form them into ball-like shapes. Grab first round with floured hands and let the loose, soft dough stretch and fall away from your hands a few times before landing the dough on your prepared baking sheet/paddle. 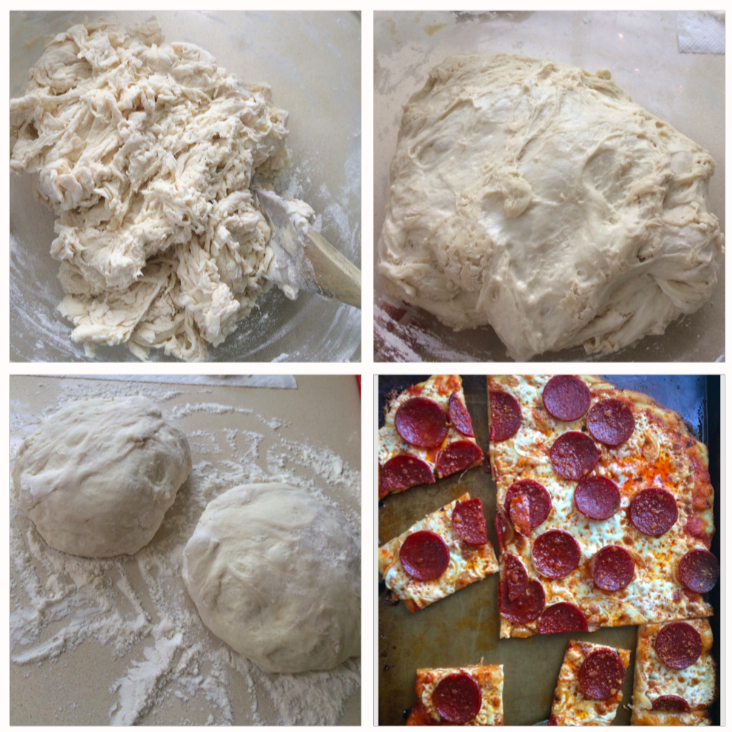 Use floured fingers to press and nudge dough into a roughly round or rectangular shape. Add desired fixings and bake pizza for 10 to 15 minutes, rotating if it’s baking unevenly, until the top is blistered and the crust is golden. Repeat with remaining dough. I like to top mine with a thin coat of pizza sauce (the mario batali one is pretty darn good), fresh mozzarella (do not use the one they store in water), thinly sliced onion, and good quality pepperoni. A sprinkling of parm doesn't hurt. Working the dough to a thin layer on the pan is the hardest part. If it is tough, let it hang out a bit and try again. I also found that doing it on top of the slightly warm stove makes it easier. My pizzas tend to take more time then above, closer to 15 minutes. When the dough is starting to brown on the edges, it is done. Let it sit and cool for a bit and set up. This has become a bit of a weekly tradition, so I hope it can be in your house too!